Though it can be said for all East Carolina baseball fans that the last three seasons have been something very special, it has been particularly enjoyable for one former Pirate. 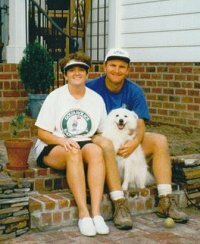 Daniel Boone, a tenacious right-hander in the mid-1980s, has been pitching by proxy in the form of current hurler Neal Sears, and the experience has not only stirred memories of his playing days, but has also rekindled his love and connection to the East Carolina family. 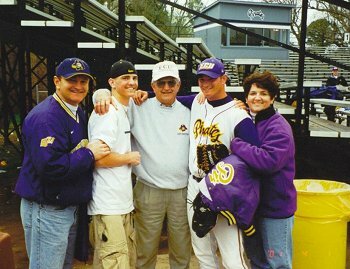 Bloodlines tend to be a much tighter tether in the South, and for Boone, when his nephew Neal decided to take his abilities to East Carolina, there was a wash of pride and passion that poured over the former Pirate pitcher. “I love watching (Neal) play,” Boone said. “Neal and I are as close as any uncle and nephew can be and when I watch him pitch, I love it. I go (to Greenville) when he is pitching and I always catch (the games) in our area here (around Raleigh). But (watching), it can be painful, too. Not physically (painful), but mentally. When Boone watches, he feels the emotions and sometimes, when a Pirate hurler is struggling, he feels his right elbow act up a little. As a sophomore at Fuquay-Varina High School, Boone was a key cog in a three-pitcher rotation that carried then-young head coach Milton Center’s Bengal Tigers to the state championship. Though the club fell to Cherryville in two-straight games, the pitcher/infielder Boone was named an all-state honorable mention. Along with the success came some professional scouts. Though Boone never thought that the pros were an option in high school, the visits from the talent scouts did serve to inspire the young standout. 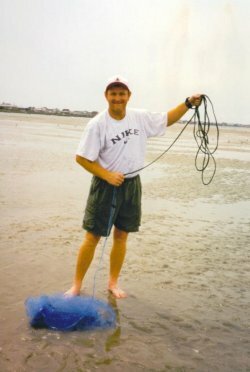 Boone, who always wanted to be an engineer, dreamed of going to Clemson. And for the remainder of his prep career, the Tigers recruited him. So with Clemson out of the picture, Boone pinned his hopes of an engineering degree and baseball on North Carolina State. “After (Clemson fell through), I hoped that State would be interested because of the engineering school, but that didn’t work out,” Boone said. “East Carolina showed the most interest in me and had offered me a scholarship, so I went there. And from the get-go, I loved it. The dream-like atmosphere quickly ended for Boone in the form of then-head coach Hal Baird, whose blunt approach served as a wakeup style welcome to big-time college baseball. And, it didn’t help Boone’s case that an aching elbow had him pinning his collegiate hopes on landing a job on third base despite being brought in by Baird to throw the baseball. “Baird was a very… well… you were afraid to talk to him,” Boone said. “He acknowledged the upperclassmen, but as a freshman, you were a nobody unless you were a superstar. "(Baird) was just not very approachable. I respected him a lot. He played pro ball and was good friends with (former Kansas City hall-of-famer) George Brett and everyone knew he was a tremendous player when he was at ECU. But, he was the type of coach that would stand behind second base with a clipboard writing down every mistake every player made. All of one day into his first fall practice, Boone broke his foot chasing down a foul ball on the third-base line, sidelining him until October. He got little playing time that season. He moved to right field his sophomore season, but saw a senior in the lineup ahead of him. Boone requested a redshirt for the season, holding out hope that he would become an everyday player in right field. But that would also never materialize. “I was a great pitcher in high school and Baird wanted me to come to ECU to pitch,” Boone said. “I didn’t want to pitch because my arm would get so sore. But, I was really a better pitcher than anything else. A change at the helm had occurred with Baird resigning and assistant Gary Overton taking over. Much like his sophomore season in high school, Boone saw his best collegiate season that year. That season, Boone posted a 5-1 record on the hill and, in large part, credits Overton for that success. “My first appearance was against North Carolina State,” Boone said acknowledging the irony. “I didn’t make it past the first inning.
" They had a couple of infield hits, then I walked a guy, and then a base hit and I’m out of the game. It was my first, and only, loss my sophomore year. Overton’s faith in his young pitcher yielded a strong season from Boone. And that faith is something that has endeared Overton to his former player. “The thing I always admired about Coach Overton is that he is a guy who absolutely loves baseball,” Boone said. “He was a true student of the game and took a lot of pride in trying to teach kids and players. He really cared about the kids and developing them as a player. He was the one that gave me the opportunity to play and that has always meant a lot to me. The inspired sophomore came back to throw a complete-game victory over Purdue and it validated his coach’s decision to stick with him. Boone locked into the rotation as the fourth starter, the off starter, and would come out of the bullpen now and then. In retrospect, Boone sees his sophomore year as one that showed his great potential and revealed his limitations. His arm couldn’t stand up to the wear and during the summer prior to his junior season; it went from bad to worse. Though the Pirates went to the Regionals that season, Boone really regrets that he couldn’t have contributed more in his postseason opportunities. Today, times are not so tough on Boone. He is back home now, back in Fuquay-Varina, working in Raleigh. He is putting to good use his electrical engineering degree he earned at UNC-Charlotte after he graduated from ECU. He accomplished his dream of becoming an engineer. Now, he uses those skills to make life a little safer for all of us. His company specializes in safety certifications for products. Personally, Boone has worked on certifying the safety of electric signs and temporary power taps among other things. After school, with his degree in hand, he returned home where he met and later married his wife, Ruth. 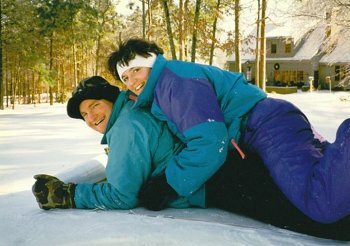 Daniel Boone enjoying the snow with wife, Ruth. Being home was huge for Boone, whose family is very tight. So tight, that his sister – Neal Sears’ mother – lives just five houses up the road. His nephew’s choice to pitch for the Pirates has reconnected him to his alma mater and rekindled his love for his university. Boone now is a very active member in the Wake County Pirate Club and gets out to as many games as possible. He is an avid golfer, sporting an impressive four handicap, which helped him qualify for the North Carolina Amateur. And he is back home, working in a job that he loves. And when he watches his nephew fire a pitch for today’s Pirates, he knows that his contributions to the program were, indeed, valuable. Electrical Engineer, Underwriters Laboratories, Inc.
5. Greatest Moment as a Pirate baseball player? “I’d have to say it was during my sophomore year. That year was my best year as an actual player, performing on the field. We had made it to the tournament in the conference. The tournament was at Harrington Field, and New York Tech had come down and we were down fairly late in the game. I came in with the bases loaded and no outs and struck out the side. We came back and won that game.